Now more than ever students across university campuses are craving to go abroad. Fall, spring and summer sessions offered by the University of Arkansas are making some students’ dreams come true. However, the hunger for a global experience does not stop at a brief stint in a foreign country. Students are expanding their horizons to internships, extending their stays in other countries to develop their look on the global society. 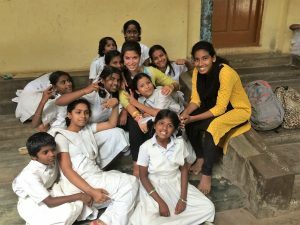 It is with programs such as the India Study Abroad Summer Session offered by the Department of Management in the Walton College that make these internship-study abroad combinations possible. 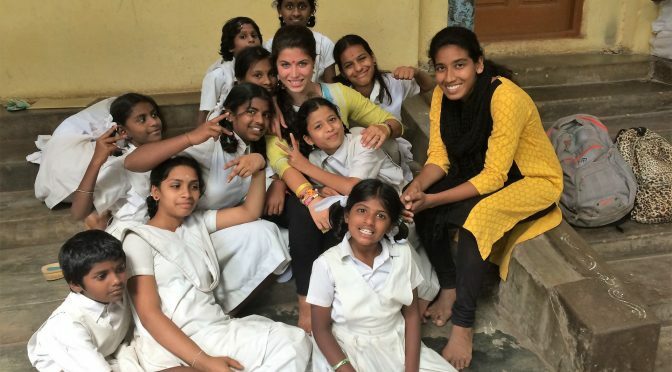 Devon Palumbo was one of several students from the 2017 summer’s session who traveled across the world to India. Without a doubt, Devon’s experience on the study abroad was incredible, but it was her time interning for an orphanage where her life changed. Many students who travel on Walton College study abroad programs have similar outlooks on careers. Devon, like most students, wanted to graduate and receive a full-time position at a large corporation. Much to her surprise, Devon completely changed her mind during her eight weeks in India. The orphanage opened Devon’s eyes to possibilities she had not yet thought of for her career. She found her passion for NGO’s (non-governmental organizations) and not-for-profits. The opportunity helped Devon solidify her outlook on what is important to her in a career. A fellow study-abroad intern, Sean Street, worked for a company called Wishfirm. He was able to figure out a game plan for his career while working in India. He had been set on the financial market and technology world, but Sean gained knowledge of Indian society that helped open his eyes to a whole new realm. Students who choose to spend their summers in a different country with few contacts, a massive language barrier and limited work experience are returning home with eyes set on their dreams. These interns immersed themselves in the society of India. They created day-to-day schedules and learned to live like locals. Devon’s job at the orphanage was one that was especially grueling. She said that the children awoke at 5 a.m. for chores, then morning prayers and breakfast. School began at 9:30 a.m. Devon taught mathematics and English. Her seventh-grade class was her favorite because they had the most energy and excitement to learn. Not only did Devon teach, but she did “a little bit of everything” including working in the business office or whatever the orphanage needed on a particular day. Adjusting to living in a country with more than a billion people can be a trial. Evan Verucchi, another student from the Walton College, said that she would wait for “who knows how long” to ride a bus an hour and a half from her apartment to her job at Walmart Global Sourcing. Sean Street would travel up to two hours to work, taking various forms of transportation. He said he would see roughly “a million people a day travelling to and from work.” These experiences made their internships in India unique. Long commutes and extensive work hours meant the interns experienced the country like no one could without living there. 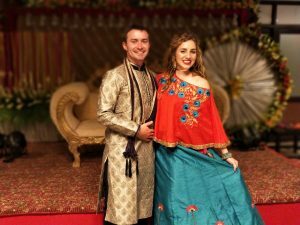 Evan and Sean were invited to a wedding in the Himalaya Mountains through the connections they made at their internships. Devon stayed in the hut of a 101-year-old freedom fighter who had worked along with Gandhi during India’s struggle for independence. Here, she soaked up every ounce of wisdom and advice the man had to offer. Devon, Sean and Evan traveled together to the beaches of Goa and a jungle resort in Kabini. Each overcame the language barrier and made incredible memories with people they would have never encountered without traveling abroad. All of the traveling and work allowed them to return home with lessons to apply to their own lives while living in the United States. For Devon, it was the resiliency of the girls in the orphanage. Each day a new child would be dropped off at the orphanage, crying from their horrible circumstances. Devon said that it was surreal how the little children were able to take their situations and stay positive and happy. “Even the little children in the slum who had close to nothing, were happy,” said Evan when asked what lessons she learned while in India. Evan also talked about how when learning about a new culture, it is important not to judge the differences, but research and find meaning behind them. She believes that if someone can do this, then his or her perspective can change because of their new insight. Devon said one trend in India now is to have a fundraiser for a birthday party. 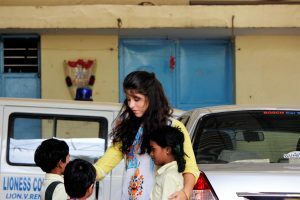 People go to orphanages or different NGOs and donate their time and money as a type of celebration. Devon found this special and wants to make it happen in America.